As mother I’ve wanted to have a tattoo represent my life with my two girls. Rachel transformed my first tattoo on my lower back. 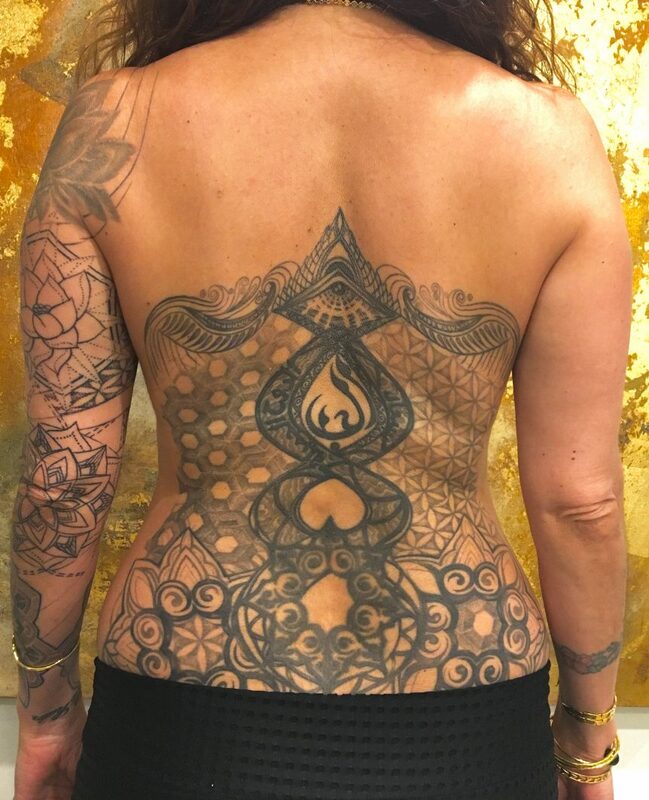 She created this back piece and I chose the seed of life and the honeycomb pattern to represent the start of my girls’ lives and the home that I’ve made for them. These patterns surround the Arabic symbol of love from my family heritage. As a female business owner of the Beauty Bar in Wailuku, I am always looking to work with and alongside other inspiring entrepreneurs. Working with Rachel to design this tattoo was such a pleasure. She created a beautiful piece to last a lifetime of memories with my family beside me. I continue to trust this artist to beautify my skin. My project this year is my arm which symbolizes my connection to the practice of transforming the body through yoga.